We are an installation/maintenance company abiding with the Spanish regulation for thermal installation in buildings (known as RITE), our company is registered on the register of companies of the Valencia Regional Government. We carry out all types of ventilation and air change installations and we always use the latest technology and the most innovative products on the market. If you are thinking about fitting, changing or improving your ventilation or air change installation or if you are planning a new installation, ask us and we will customise your needs with the best progresses in control and energy saving. Ventilation or air change consist of replacing unbreathable or polluted air of a room (house, office, premises, garage……..etc.) by new air. Ventilation can be carried out in a natural way or it can be mechanically forced by means of fans and turbines. 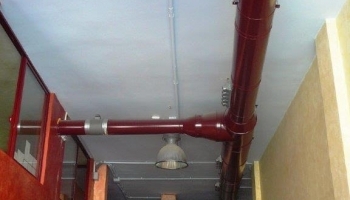 "Buildings should have the means to ventilate their facilities properly, to remove the pollutants usually formed during the normal use of the buildings, so that a sufficient flow rate can be provided from the outside air and to ensure the extraction and expulsion of unbreathable air due to pollutants." The CTE (Technical Building Code) demands smoke evacuation in case of fire and forces, among other things, the extractors to be able to support temperatures of 400ºC during 90 minutes, to apply an extraction of 120 l/s (432 m3/h) per vehicle place. The REBT (Spanish Low Voltage Electrical Regulations) sees parking as premises with fire or explosion risk. Thus, it requires emergency lighting and complementary power supply for parking of more than 100 vehicles. Nevertheless, it is being considered that with the ventilation the explosion risk is reduced and, therefore, the electrical installation can be normal. "Garages of more than 5 vehicles are considered sites with explosive atmospheres with class I explosion risk, therefore, its equipment must be designed and built to work in Explosive Atmospheres (ATEX)." We carry out any type of garage extraction/ventilation project in accordance with current legislation, from the design and estimation up to the ducts installation. 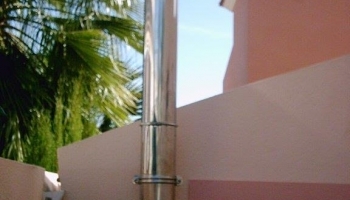 Chimneys are defined as ducts built to provide a way out of combustion gas – or gas from a chemical reaction (“tail gas")- to the atmosphere for its dispersal in the ambient air. For the determination of the characteristics of a chimney it is essential to know the kind of fluid expected to go through it. Usually, these fluids are smoke from the combustion of fossil fuels (coal, oil derivatives in liquid or gaseous states), wood, etc., in the ambient air. However, even in these cases, potential “pollution" of this smoke with substances emitted by the processes in which it takes part, such as industrial stoves, ovens, gasoil boilers, pellets, gas, …etc., should be considered. We design, advise and install any type of ventilation or smoke extraction chimney, may it be for a restaurant, a bar, a boiler, a garage,…. etc. 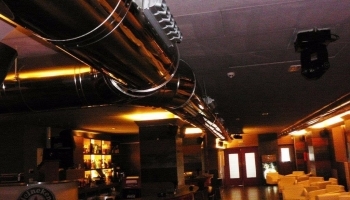 Restaurant establishments with cooking devices are forced to extract smoke from cooking, by means of an installation formed by a chimney and an exhaust hood. Because of the economic cost it entails and because of the complexity of the installation, we always recommend to seek for advice from a qualified technician with experience in the design of a smoke extraction installation. We estimate and manufacture any kind of stainless steel exhaust hood for smoke removal, standard or customised. Fiberglass air ducts. They are formed by cutting, folding, stapling, taping and siliconising the fibre panels covered with aluminium on both sides. All the necessary pieces of rectangular sections can be manufactured on the building site itself, which is one of its main advantages. The material of which they are made have got excellent thermal and acoustic insulation properties; thus, they do not need specific insulation. They are mainly used in the housing sector, in premises and offices. Air conditioning ducts are usually installed in dropped ceilings, so they are hidden; we will only see the small grids through which the air is distributed, which will be more discreet and aesthetic. However, there are also decorators and architects who prefer to install the ducts in sight to provide a more “industrial" style. We carry out any type of fiber duct installation project in building sites, in accordance with current legislation, from the design and estimation up to the ducts installation. Sheet metal ducts. They are made by folding stainless steel or galvanised steel sheet spools, they can be made in circular and rectangular sections. The sheet metal ducts are normally used in large facilities such as warehouses, big stores, etc. They can be painted so they are integrated into the workplace design. 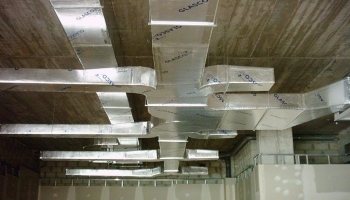 We carry out any type of stainless steel or galvanised sheet metal duct installation project for premises, warehouses and big stores, in accordance with current legislation, from the design and estimation up to the ducts installation. Textile ducts. The new textile ventilation ducts for the air conditioning, ventilation, heating, refrigeration, air change, filtration and air purification field presents major advantages. Diffusion by means of textile ducts or textile diffusers gives a perfect air distribution (temperature uniformity, destratification, injection rate control, etc.) These ducts are only valid for air supply circuit as it is the air pressure itself which keeps the circular section, it cannot be kept in other extraction or return ducts. The most appropriate names for textile ducts are air textile suppliers or air diffusers. But other names such as textile tubes, fabric ducts, air hoses, bag of air, tights of air, socks of air are also used. 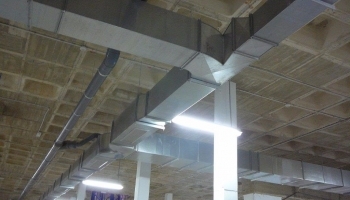 We carry out any type of textile duct installation project for premises, food industry, pools, workrooms……..etc., in accordance with current legislation, from the design and estimation up to the ducts installation. 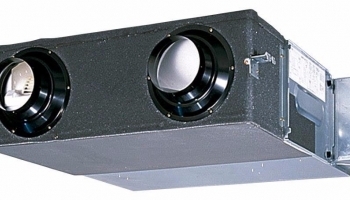 Ventilation boxes with centrifugal fans Â 400º 2h are required in Parking and Industrial stoves installations. 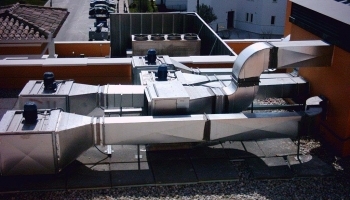 Nowadays, it is a regulatory requirement to install 400º 2h fans in all the smoke extractions in exhaust hoods belonging to the hotel industry and the heating power of which is higher than Â 20 KW. We carry out any type of extraction/ventilation project that may need ventilation boxes for garages, kitchens, etc., in accordance with current legislation, from the design and estimation up to the ducts installation. 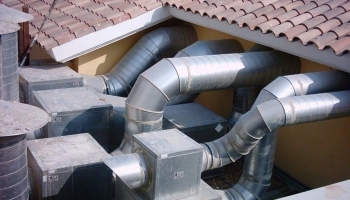 Heat recovery ventilation are devices the function of which is to use the psychometric properties (temperature and humidity) of the air that has been removed from the building or premises and exchange it with the ventilation air propelled outside. In this exchange process the internal and the external air are not mixed. The main purpose of a heat recovery ventilation is to recover the energy used to air condition an area by transferring the heat of the air extracted from the inside of the premises to the heat propelled from the outside. We carry out any type of extraction/ventilation project that may heat recovery ventilation for premises, offices, etc., in accordance with current legislation, from the design and estimation up to the ducts installation. 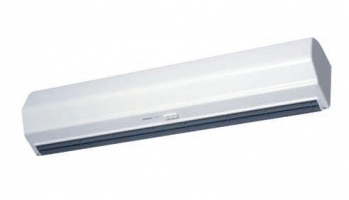 An air curtain is a ventilation equipment that creates an invisible barrier above a door to divide two different atmospheres in an efficient way; avoiding the entrance of insects, particles and smoke, without limiting the access to persons or vehicles. It is also used in cold rooms for loading and unloading products.